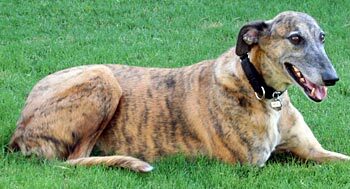 Bryn is a sweet 8 to 9-year-old brindle female. Bryn is not tattooed, and her age is estimated by Dr. Jeff Ellis of VCA Preston Park Animal Hospital. GALT was contacted by a coyote hunter in Amarillo who said he had three dogs to get rid of...and of course one was Bryn. It is obvious she has given birth to puppies. Dr. Ellis thought she could have had as many as 50 pups; bless her heart! 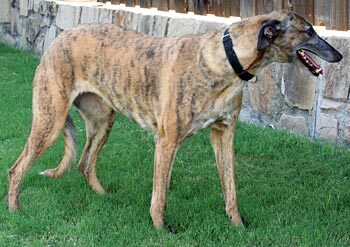 When Bryn arrived she tested positive to Ehrlichia Canis, Babesia Canis, and had a uterine infection. This infection dictated that she should be spayed immediately. 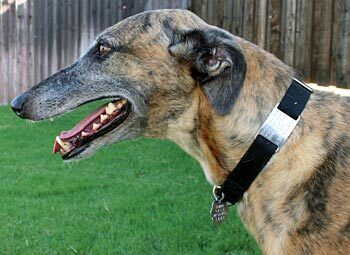 She was treated for the Ehrlichia and Babesia. A second Protatek test did not show significant drops in her titers, so a PCR (polymerase chain reaction) test was performed. This tick-borne panel test shows if there is an active infection in the body. All of Bryn’s results showed she is negative to these! Bryn is ready to find her forever home with a soft bed! Bryn is not cat tolerant, but she is small dog tolerant, and she plays very carefully and cautiously with Pocket, the Italian Greyhound. With all the dogs we’ve had over the years, Bryn is the only one we can remember who is so patient during food preparation time and who shows her gratitude in such a sweet way. She patiently waits at a distance in the kitchen while we prepare her food. Then, before she takes her first bite, she will look up at us sweetly. It's as if she is saying, "Thank you." That sweet look always garners her a special pat or rub on the head. Bryn loves to go for walks. She does like to dart after rabbits though. It's like she's wearing night vision goggles - she spots all of them! Bryn also likes her squeaky toys. She loves for us to play with her by throwing them; or trying to get them from her while she's running through the house. Sometimes she'll sneak one out into the back yard too. The back yard is a favorite place for Bryn, especially when we’re out there too. She especially loves to sunbathe. Even when the weather was cold, we'd find her outside sleeping in the sun. Bryn plays very sweetly with our ‘grand-dog’ Pocket, who is an Italian Greyhound. Although Bryn has never shown any sign of aggression toward smaller dogs, we do monitor the encounters just to be safe. No one smiles like Bryn! It's precious to see her smile and to hear her voice and excitement when she is smiling. It always makes us laugh. Come meet Bryn and let her smile for you!